KZRV is recalling 38 model year 2018 Sportsmen LE recreational trailers. 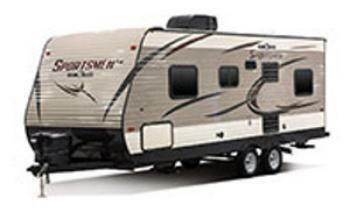 The trailers were supplied with spare tires whose size and load capacity are incorrect. If the spare tire is used while the trailer is fully loaded, it may fail, increasing the risk of a crash. KZRV will notify owners and dealers will replace the spare tire with the proper one, free of charge. The recall is expected to begin on August 12, 2017. Owners may contact KZRV customer service at 1-800-768-4016 extension 154 or 153. KZRV's number for this recall is KZ-2017-04.